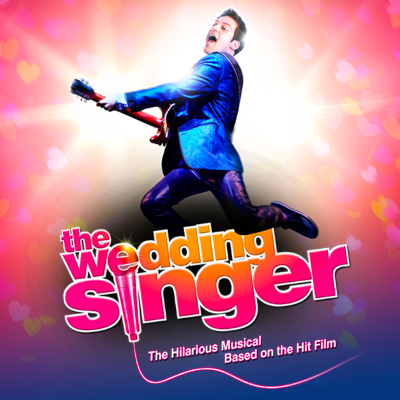 Based on the 1998 movie, The Wedding Singer is based around Robbie Hart (Jon Robyns), a wedding singer by trade whose own wedding is fast approaching, where he will marry longtime sweetheart Linda (Tara Verloop). However, Linda does not show on the day, leaving a note which does little to make Robbie feel better. His situation is compounded by the engagement between Julia Sullivan (Cassie Compton) and New York hotshot Glen Gulia (Ray Quinn); Julia works as a waitress and is a close friend of Robbie, so much so that Robbie had agreed to sing at her wedding should she and Glen ever tie the knot, but prior to Robbie having his own heart broken. Therefore, it takes some time and much persuasion from Julia for Robbie to honour his commitment. In the meantime, Robbie assists Julie with wedding preparations, but after some gentle prompting by Julia's friend Holly (Stephanie Clift) to "practice a church kiss", Robbie and Julia lock lips, and it quickly becomes clear that the two have developed feelings for each other. This slowly evolves amidst Robbie learning more about Glenn's lifestyle, which included regularly cheating on his bride-to-be. In the meantime, Robbie's music career (in a band alongside Sammy, played by Ashley Emerson, and George, played by Samuel Holmes) stumbles as it is clear that his feelings towards Julia, and his romantic feelings having been severely dented by Linda no-showing their wedding. It all comes down to a situation whereby Julia and Glenn jet off to Las Vegas to wed, and only Robbie can potentially put a stop to proceedings and express his true love for Julia, who by this point had communicated HER romantic feelings towards Robbie through Holly. Obviously, the musical follows the story of the movie for the most part (there are certain changes within the storyline and, of course, with the inclusion of additional songs, but the general plot remains the same). Therefore, anyone who has seen the 1998 film will know what to expect, but even those who don't should have a good time. There are quite a few comical scenes and lines, and the story is easy to follow. The emphasis is purely on humour, even during the more serious or emotional scenes, so it's a light-hearted tale from start to finish. In particular, Jon Robyns is believable, entertaining and sympathetic as Robbie Hart, and although his career prospects as a wedding singer are never likely to make a massive impact, the audience is always hoping for him to achieve his dreams on a romantic level, especially after being ditched at the altar. Cassie Compton also puts in an excellent performance as the likeable Julia Sullivan, both from an acting and a singing perspective; Jon and Cassie steal the show in a pretty star-studded cast, which includes Ruth Madoc as Rosie and the aforementioned Ray Quinn. The settings are very good, as are the use of additional props where appropriate, and the lighting is very cleverly used, especially during one scene where the lighting conveys Julia and Glenn's plane taking off to Vegas. On the negative side, the running time of the first half was a little long, coming in at close to 90 minutes, and I expected to see a little more of Ray and Ruth. There was also heavier sexual content than I expected, given that the movie made only occasional risqué references, and the (largely older) audience seemed a little uncomfortable during one particular scene towards the end. But there's a lot more to like than to dislike, and there's quite a few surprises too, such as some amusing celebrity impersonators towards the end. Summing this show up, then, The Wedding Singer is a lot of fun with a fair number of memorable moments, and a faithful recreation to any fans of the original movie.